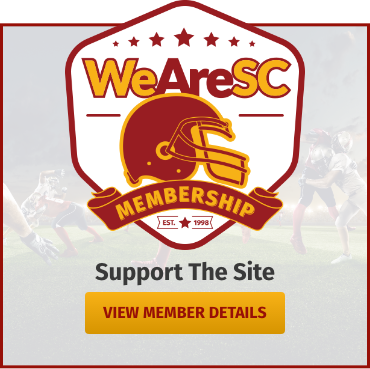 In this week’s roundtable, the WeAreSC staff gives their thoughts on the coaching staff moves to this point, and offers opinions on the final moves they would make. Q: What are your thoughts on the coaching moves thus far? I am not so sure this “staff” makeover is significant enough to make a major difference, but there’s certainly food for thought. Nansen to inside linebacker makes sense; Colbert to wide receiver coach is a very positive move regardless of the offense schemes; no shock that Drevno is the permanent offense line coach, but he is known for coaching a power running offense, so what happens if Helton brings in another Air Raid disciple? As for Burns at DB, I think that was an improvement no matter how you look at it. It was time for a change in the secondary teaching. Kauha’aha’a for the D-line should be an interesting change to follow as the season unfolds; he appears to have a solid track record. However, it’s still Clancy Pendergast’s defense, so we’ll see how that plays out with the new D-line coach. To me, the one coach in question is the promotion of DeForest to outside linebacker coach. I think there are questions marks there based on his resume. I don’t think Helton has accomplished a major staff makeover because we don’t know who the new OC will be, and we have to wait to see if new running backs coach even Mike Jinks, brought in by Kingsbury, sticks around or is taken by Kliff Kingsbury as part of his new Arizona Cardinal staff. Individually, I feel good about some of those coaches. Nansen has been indispensable as a recruiter, Drevno has a quality resume as an OL coach and I think he did a nice job with a bunch of freshmen his first time at USC, and I think Kauha’aha’a and Burns are probably upgrades over their predecessors. But collectively, it’s hard to feel good about this staff. Remember, everybody agrees there are substantial problems with this program. It’s hard not to admit that after the worst season in two decades. In Lynn Swann’s public statement, he said that he and Clay Helton “acknowledge and understand our deficiencies in areas that include culture, discipline, schemes, personnel and staff” and he said they “agree that changes need to be made.” Many of us questioned whether USC would make the necessary changes without changing the guy in charge. There are examples of programs that re-invented themselves while still maintaining the head coach, but those examples are few and far between. Usually, when the head coach sees the program slip and starts firing assistants, the program continues to crater and he gets fired. That’s what usually happens. But Lynn Swann pointed to Notre Dame as a counter-example, and he identified ND’s overhaul under Brian Kelly as an precedent for what USC would do. It’s not what USC has done. Brian Kelly fired everybody. USC has kept almost everybody. Of the seven names mentioned above, five were part of the program last year. And at the higher levels, little or nothing has changed. 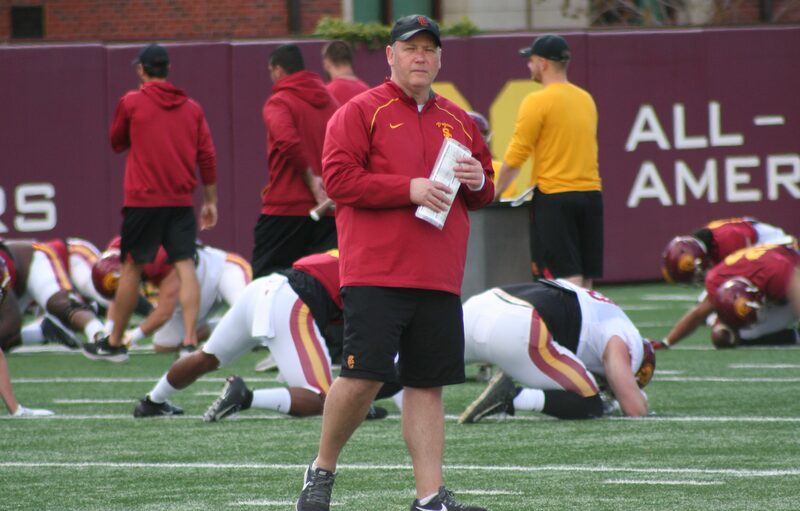 USC has retained its defensive coordinator, its special teams coordinator, and its strength and conditioning coach. It still does not have an offensive coordinator, obviously. USC kept virtually everybody that gave us this mess in the first place. The only significant change that Clay Helton has made publicly blew up in his face. 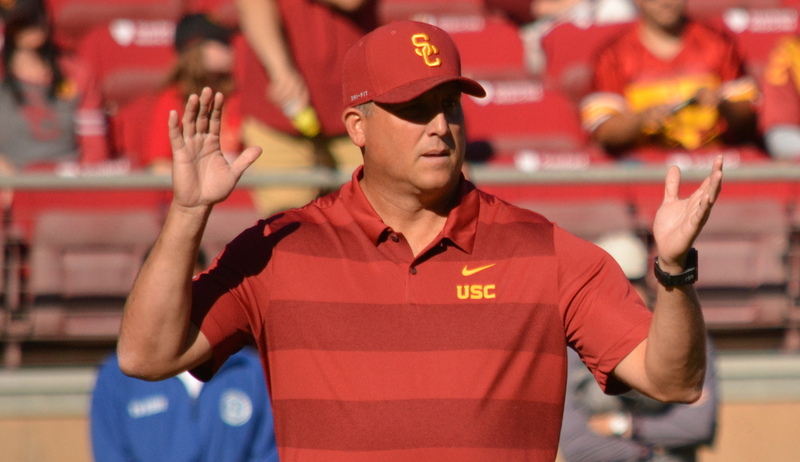 So I’ll say this bluntly: either Lynn Swann and Clay Helton were less-than-forthcoming with USC fans in their public statements – and they never intended a true overhaul of the program – or they meant what they said but have pursued the overhaul this offseason with the same level of skill and foresight with which Clay Helton handled the 2018 football season. 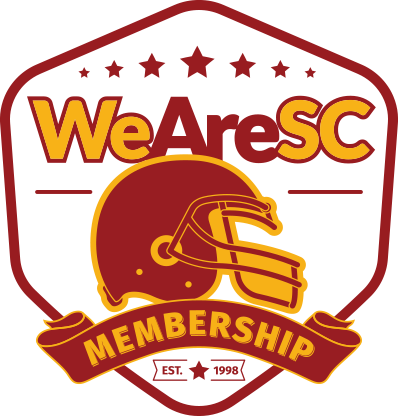 I’ll let WeAreSC readers pick their own conclusion. Nansen: I think Johnny Nansen is a valued member of Clay Helton’s coaching staff. If there were to be turnover at the head coaching position, I think Nansen would be one of three coaches that would possibly be retained. That speaks to his commitment to developing young talent and his ability to connect with recruits. If you look at his body of work during his tenure at USC, his units have done well—both running backs and linebackers. He was a Broyles Award nominee, an award given to the top assistant coach in college football. DeForest: I don’t understand how the interior linebackers can be separated from the other linebackers. The communication has always seemed funky and that seems like it will continue because I just don’t see how everyone on defense can be on the same page if they are not meeting and watching film in the same room. Division during critical preparation time is a head scratcher and with all the new changes one would hope defensive coordinator Clancy Pendergast chances the way that the defense meets and allows for more group film sessions—something I am told rarely happened as a defensive unit last season. Colbert: I like the move with Keary Colbert. I feel like he has paid his dues and has a lot to offer a receiving corps that struggled to get free releases off of man cover. Colbert will teach them how to get separation and stack defenders so they don’t always have to rely on 50/50 balls. They will also be better at running all the routes on the route tree—an area that this team has struggled to develop in the progression of the playbook. Drevno as OLine Coach: Tim Drevno will finally have a full offseason with this roster and we should begin to see his thumbprint on the offensive line’s identity. I would expect to see noticeable improvements in pass blocking concepts and techniques. I’m not sure about Baxter to tight ends. I would have liked him to remain solely focused on special teams—in particular, the punt unit, which was subpar. Diverting his attention makes me wonder about how well the special teams will be prepared for situations if Baxter’s attention is diluted. Kauha’aha’a: I don’t know much about him other than Boise State has always been formidable at the line of scrimmage and played with great pad level and won a lot of one-on-one battles. USC defense must get production from the returning interior line and Kauha’aha’a has his work cut out for him, but Kenechi Udeze left the interior defensive line with a solid foundation. They got tremendous production absent an outside pass rush. After promising wholesale changes, the coaching “shakeup” feels overall a bit like when a fast food chain makes a big deal about how they are using all new ingredients and you won’t believe the difference. Same slogan. Same goofy mascot. Same experience. And ultimately, the same food coming out of the same kitchens. Now, that’s how it feels emotionally after seeing a 5-7 season and hearing promises of tearing the program down and truly hitting the reset button, only to see so many familiar ingredients simply shuffled and repackaged. But I don’t blame Clay Helton for going this route, and I’m not at all ready to write it off as a failure. He was told to keep pushing forward and I think a head coach needs a certain level of familiarity with his assistants in order to consistently be on the same page. The absolute must-haves were new offensive line and secondary coaches and Helton delivered there with what appear to be significant upgrades. Helton has decided to hitch his defensive wagon to Clancy Pendergast, which I am fine with. We’ll get a quick sense of how all this plays out, as final grades are coming after the first six games of 2019. Q: How would you like to see the rest of the coaching staff filled? I am very concerned about the balance of the staff. Even before the addition of Kingsbury, there has always been a question of Clay Helton’s offensive identity and play calling. It was actually quite revealing to me that Helton would basically junk his offense and put all his eggs in the Kingsbury basket. Well, we all know how that played out. So now the question is: What offensive system will the Trojans run now with Kingsbury’s departure? Will Helton try to find somebody from the Kingsbury coaching tree? Does Helton know what he wants to do, or will he be told what to do? Was Helton really totally sold on the “Air Raid” offense to save his job, or was it Lynn Swann’s idea? Honestly, it’s anybody’s guess at this point who will be the new OC and QB coach. One thing that remains unanswered: Will the new OC be allowed to run his style of offense, select the best fit at quarterback, and will that new coach have the same authority that Kingsbury was given? So many questions and so few answers at this point. I would like to see Clay Helton articulate a philosophy for USC football and then make decisions that lead to the successful implementation of that philosophy. When Helton was hired, he said he wanted a return to traditional USC football: a physical, run-first football team. Just weeks ago, Helton said he is the son of an offensive line coach and believes in running the football. And then he hires one of the architects of the Air Raid offense. What are we to make of that? I don’t know. I don’t think leaders should be held accountable for implementing someone else’s philosophy. I don’t think Wazzu fans can complain that Mike Leach has a mediocre rushing attack. I don’t think Navy or Army fans can complain that their teams have weak passing attacks. Those schools hired coaches with known philosophies, and the only fair question is whether the coaches are successfully implementing the philosophies they promised when they were hired. But fans do have a right to complain that a coach cannot successfully implement his stated philosophy or, in Clay Helton’s case, hasn’t even appeared to try. USC recruits, lifts, conditions, practices, and plays like a finesse football team. That’s what USC has done for three years. If Clay Helton wanted to turn USC into Washington State – though, sadly, weaker than the real Washington State at this point – he should have said so. And as long as he continues to articulate a philosophy without really trying to implement it, I’m not sure it matters who else fills his coaching staff. To make up for the loss of Kingsbury, I think that Clay Helton and athletic director Lynn Swan may consider bringing in an offensive specialist like Tom Moore, the former Arizona Cardinals and Indianapolis Colts offensive coordinator. He is a Norm Chow-like presence and has always featured 11 personnel groupings–one back, one tight end sets–utilizing players such as Edgerrin James, Dallas Clark, Reggie Wayne, Marvin Harrison, and Brandon Stokely. He orchestrated, with Peyton Manning at quarterback, some of the most prolific NFL offenses. While in Arizona as a consultant, USC Heisman Trophy winner Carson Palmer had his best years as a pro. A move of this magnitude would help Helton with situational football, an area that he can really improve upon once the offense goes off script. After reports that running backs coach Mike Jinks would be on his way to Arizona with Kliff Kingsbury, the Cardinals appear ready to announce a different running backs coach, which means Jinks is likely sticking around at USC. And that means the only open coaching spot is quarterbacks coach. Helton could seemingly go three different ways in filling his staff—bringing in a coach as both quarterbacks coach and offensive coordinator, bringing in a quarterbacks coach and naming himself offensive coordinator, or bringing in a quarterbacks coach and allowing offensive line coach Tim Drevno, who has coordinator experience, to assume the offensive coordinator role. At this point, I’d like to see Helton go grab an Air Raid offensive coordinator/quarterbacks coach. Though he consistently says he wants to field a power run game, his actions show that he wants to throw the ball, and that was made abundantly clear when he brought Kingsbury in to run the offense. At this point, Helton should stop giving lip service to being a power running attack and just lean into what he truly wants this offense to be. I think Helton’s biggest flaw as a head coach has seemingly been a lack of commitment to a true plan for shaping his program. We want to run tough practices, except when we cut scrimmages short. We want to be a great running team, except when we throw the ball all over. We want to practice without pads in November, except when seniors want to wear them. We want to fully transition to the Air Raid, except when that coach leaves and now we’ll settle for something else. It feels like that could be another prime example of wanting to go in one direction and then settling for dramatically shifting course. But ultimately, I’m fine with Helton betting on himself to call plays, because these first six games are the ultimate sink-or-swim scenario and we’ll know quickly what worked and what didn’t.